A few weeks ago my place of work, STFC, was lucky enough to host NASA’s chief scientist Jim Green for a talk titled “The search for life on Earth in space and time”. At the time of writing there is a version of the talk on University of Oxfords Facebook page. A really interesting talk for anyone interested in space, and our solar system. It also goes much more in depth that this post today and gives a real insight into current science of our solar system. A planetary scientist himself he talks about the planets in our solar system that could harbor life and those that might have done previously. I found it a real insight into what NASA’s goals are and where they are looking for signs of life. I personally enjoyed the talk as Jim Green hosts the “Gravity Assist” podcast made by NASA. logo for NASA’s Gravity Assist podcast hosted by Jim Green. Credit: NASA. The first real point he made was how to define what life is, which is a reasonable question. If you want to go out and find life on other planets, how do you know when you have found it? Spacecraft and astronauts need instruments and tools to detect things, and to build those instruments you need to know what they are looking for. The definition they came up with was that life needs three things, to metabolize, reproduce and evolve. This is a pain because it’s difficult to see any of those things directly. If you take just the metabolizing part and break it down it makes it a bit simpler, you need organics, the energy source, and water. You also need some way to get rid of waste. Plus we need to take into account time, you could have a fully habitable environment but not have life if it isn’t the right time. Time is a really important factor, Earth has existed for 4.6 billion years, and it hasn’t always had life. They have been at least 5 mass extinction events in that time as well. To really see what is happening we need to look at how the sun has changed over that time, it is the thing in the solar system with the most effect on us. Since its birth 4.6 billion years ago it has brightened, with the luminosity increasing up to 25 or 30% by some estimates. We know that the Goldilocks region or habitable zone of a star exists where water can exist in all three states, but that depends on how big the star is and how bright it is, and therefore over time this Goldilocks region changes. This would make life simpler when looking for exoplanets, just work out where the habitable zone is and choose planets in it, unfortunately it isn’t that simple. Let’s start off with Mercury, the closest planet to the sun. It is larger than the moon, but it isn’t large by any means. It has a magnetic field, it is nearly tidally locked and it is incredibly hot. It out gasses, and from Messenger data most scientists have agreed that it has never had a substantial atmosphere, so water is very unlikely to have existed there. The next candidate would be Venus, it is a similar size to the Earth after all. The Soviet Union Venera missions looked at the atmosphere and the temperature, and found it is extremely hot. The surface is hot enough to melt lead, and the pressure is 90 times that of our own planet. The NASA Magellan probe found it to be highly volcanic, with a very thick atmosphere. This means there is basically no chance of water, and makes Venus a bad choice for finding life today. Using some fairly interesting concepts, scientists have modeled what early Venus may have looked like and found it likely had water at some point, but the runaway greenhouse effect along with the lack of magnetic field has stripped all water away. That being said one day we could produce probes good enough to dig through the surface and look for signs of life below the ever evolving surface layer. Five global views of Venus by the Magellan probe. Credit: NASA. The next obvious choice is Mars, much larger than the Moon, but only about half the size of Earth. It’s a bit of a runt due to Jupiter. The asteroid belt between Mars and Jupiter is made of rocks that could have been a part of Mars, but Jupiter’s massive gravitational pull denied that. We also know that at some point in its life it had oceans that covered two thirds of the surface that could have been up to a mile deep in places. It then went through massive climate change, and it lost its magnetic field. That means the solar winds have stripped away the atmosphere and left a dry and arid surface. The pressure is about 1% that of Earth. Plus as it is fairly close to Earth it means that we can visit it fairly easily. From a number of missions including satellites and a number of rovers, we know that there are organic compounds on the surface, and likely water under the surface. Although not a guarantee of life it is a big hint. There a number of missions planned including ESA’s ExoMars, and NASA’s InSight and the 2020 rover. These missions are designed to drill into the surface and understand more about the planet, and what the water held. True color image of Mars taken by the OSIRIS instrument on the ESA Rosetta spacecraft during its February 2007 flyby of the planet. Credit: ESA. We talked about the habitable zone, but there is another line (or sphere technically) that planetary scientists use called the snow line. Lying somewhere in the Kuiper belt, it defines that liquid water cannot exist beyond it. For a long time that was thought to be true, but research has revealed that some moons have liquid water below their icy surface. In 1611 Galileo discovered some of Jupiter’s moons, and they have been visited and studied by the Juno and Galileo probe. All the moons at one point had an ice crust. Scientists have found that some moons such as IO, lost this crust and have become very volcanic and volatile. Ganymede, Callisto and Europa still have this ice crust. Only Ganymede and Europa have any signs of a watery ocean underneath the crust, but Ganymede is somewhat ruled out from having life because of its very cold temperatures. This leaves Europa in this Jupiter habitable zone. Slightly smaller than out moon, it has been shown to have watery geysers that reach 400 km above the planet. That would be equivalent to Earth geysers hitting the space station. From tests by Galileo data it has been shown to have twice as much water than on Earth. Plus it has been like that for 4.6 billion years, so that is a good indication that there could be microbial or even complex life below the surface. There is a mission planned to go to visit Europa called Europa Clipper. An image showing the icy crust of Jupiter’s moon Europa. Europa is about 3,160 kilometers (1,950 miles) in diameter, or about the size of Earth’s moon. This image was taken on September 7, 1996, by the camera on board the Galileo spacecraft during its second orbit around Jupiter. Credit: NASA/JPL/DLR. Then there is Saturn, which has had many studies, and the thing that stands out is the moon Enceladus. It is the moon that really drew NASA’s attention to the possibility of water on these distant moons. It also has geysers, coming from huge cracks in the southern hemisphere. They are huge walls or water just pouring out of the body. With it being only a small moon of around 300 km, it suffers from tidal forces. The water pours out less when it is closer to to Saturn, and more when it is further away (due to an elliptical orbit). This has been measured and shown, as the Galileo spacecraft actually flew through one of the geysers and didn’t know it. We have spacecraft that have literally tasted this water. About 98% of the water that comes out of the geysers falls back onto the moon, but that 2% escapes and forms an e-ring. The Cassini spacecraft also flew through these plumes and managed to measure some of this water, and more importantly small bits of rock. It gives indications of hydro thermal vents being the cause of these plumes of water. 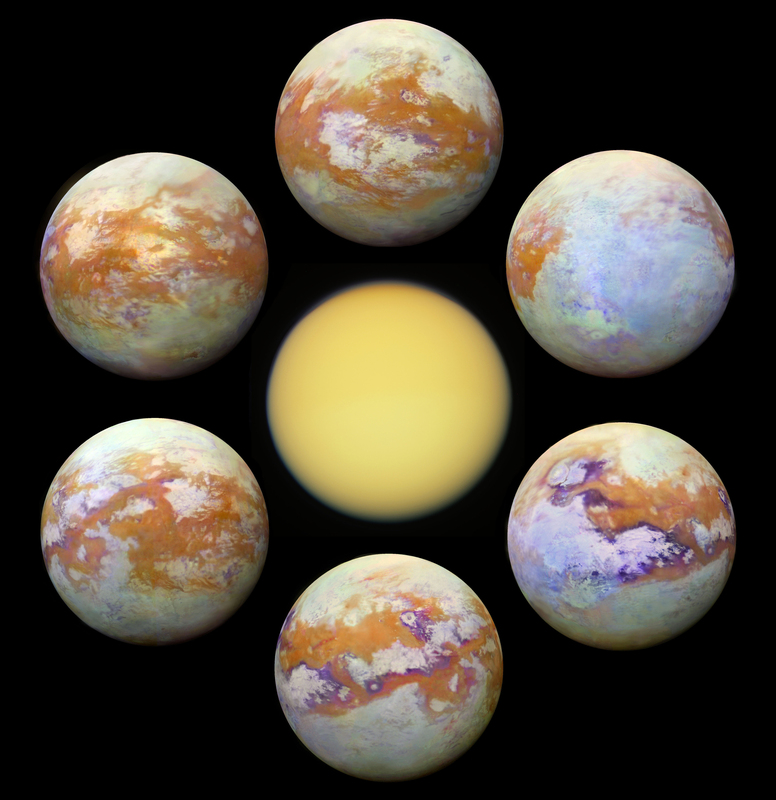 Another spectacular moon of Saturn in the running is the famous Titan. It is bigger than the planet Mercury, the atmosphere is about twice that of ours, and is dominated by nitrogen. Trace gasses of methane and ethane have been detected, and it has large bodies of liquid. Radar images of the surface piercing through the thick atmosphere show rocky terrain and flat lakes of liquid methane. This has spurred on the idea that life could be very different, and could survive in such liquids as methane. So if we want a chance of finding life not like us then Titan would be the best place to go. There are a number of important missions that are planned to visit Titan and make much better measurements of the surface. Including robotic missions and maybe even very simple rovers. By all accounts it is still in early stages. This data taken from these missions have allowed us to look further afield to find exoplanets that could fit what we now use to define habitable planets. Missions such as Kepler have refined the way to detect planets by looking at stars for long periods of time. looking at how stars dim and wobble when planets go in front if them. The big exoplanet mission for NASA currently is TESS. Launched in April it has gone through its commissioning and is already finding planets out there. The idea for it is to take large amounts of images over a long time and try to find as many exoplanets as possible. Hopefully producing thousands of potential planets, the best looking ones can then use much more powerful and advanced telescopes such as JWST to make better measurements and tease out the atmosphere and makeup of these exoplanets. One closing point that Jim Green made, when you go out and look at the stars at night, just remember that there are more planets on our galaxy than there are stars visible in the sky. One of the first images taken by NASA TESS, centered on the southern constellation Centaurus, reveals more than 200,000 stars. Credit: NASA.